I been on a number of forums for years have a weather thread, where members post today's weather in their town. Weather and meteorology is one of my expertise subjects, and I came up with this topic: How's your weather? I'm in a cool (yet gets warmer), drier phase for the upcoming weekend when highs are in the 70sF/20sC range. 51 degrees, cloudy and windy. Currently waiting for rain. I'm not sure when winter will come. Only one storm here, so far. It's been cloudy all week here in Winnipeg, with flurries throughout the day. Temperatures have been -10 C (14F) all week during the day, -15 to -20 at night (5 to -4 F). Pretty seasonal, but that's why people call Winnipeg, Winterpeg. Same here. What is winter? We have had too many days with mid 40s already at 2 a.m.*, when the normal is just below freezing. * See my signature . Around 50 and rain. Quite odd for Albany. Heavy overcast with occasional sprinkles, chilly. 50s, raining, warming to 60 tonight. Just another New England winter. 48 degrees, with a chance of flooding. Totally normal (I'm not kidding, we get so many flood and flash flood watches here). 53 and humid, yet all of the buildings on campus are on full blast heat, so I'm currently boiling. 65 degrees and showers in Milledgeville, GA.
Record high 56 degrees in Detroit today. I thought it actually got warmer right around sunset to boot. It did. High was 57 close to sunset and we're around that now. Sunny and 11. But by the time I post this it won't be current. Partly cloudy here with a high of 46°F here in Huntsville, AL today. Currenlty 42°F right now. Cloudy and unseasonably spring-like temps at 52° F/11° C. Though tomorrow we're expected to have snow (I'm hoping it's a dusting - I've a potluck to go to tomorrow night! ), which rings true the old New England maxim of "if you don't like the weather, wait a couple of minutes". Brrr. Heavy clouds, stiff breeze, 46 F.
It's a bitterly cold 63 F and sunny here. Sure, it probably sounds nice to you other people, but for me, that's just too cold! I cannot express in words how ready I am for it to be summer here. 115 degrees, the hot sunshine on my skin...I can almost feel it. A cloudy day with a nice 43 degree temperature here. Partly cloudy today with a high of 51°F. 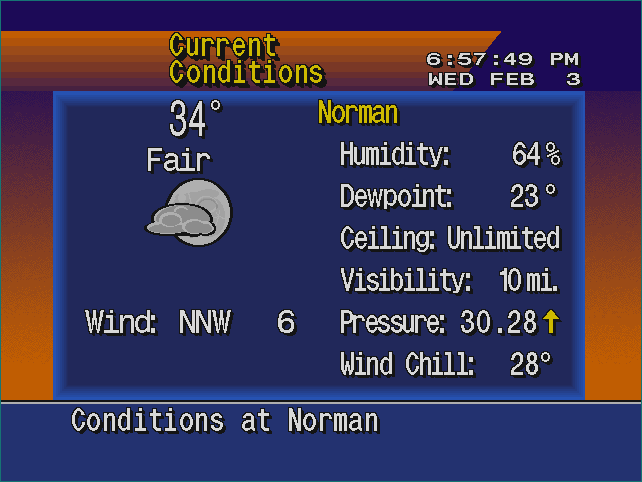 The current temperature is 44°F.